This glossary defines ringing terms used in teaching at our tower. An authoritative and very complete glossary is presented in The Tower Handbook, pages 309-360.
in general does everything you are going to do, immediately after you (except when the treble intervenes). In Plain Hunt and in most methods, it is advantageous to know which is your after bell, namely, the bell after you in the coursing order. See also course bell. Back · A bell is at the back when it rings after all the other bells on that same stroke, other than any bells that are tenoring behind. Backstroke · A ringer rings her bell using two different strokes, a handstroke and a backstroke in alternation. The backstroke occurs when the rope is wrapped around the top of the wheel (see figure), and both the ringer’s hands are on the rope’s tail only. Backstroke lead · A backstroke in leads. Strokes in leads are of particular importance for keeping track of where one is in a method, and for helping the band stay steady. Balance, At the balance, Over the balance · A bell is at the balance if it is mouth-up and just past vertical, with its weight balanced just beyond its axis of rotation and held in place by a very light tension on the rope. A bell goes over the balance when the ringer increases the tension on the rope, the bell’s weight moves over and past the axis of rotation, and the bell starts to swing down. The bell is at the balance when it is between vertical and set, with its weight supported by the rope, and over the balance when it is on the other side of vertical and swinging down. 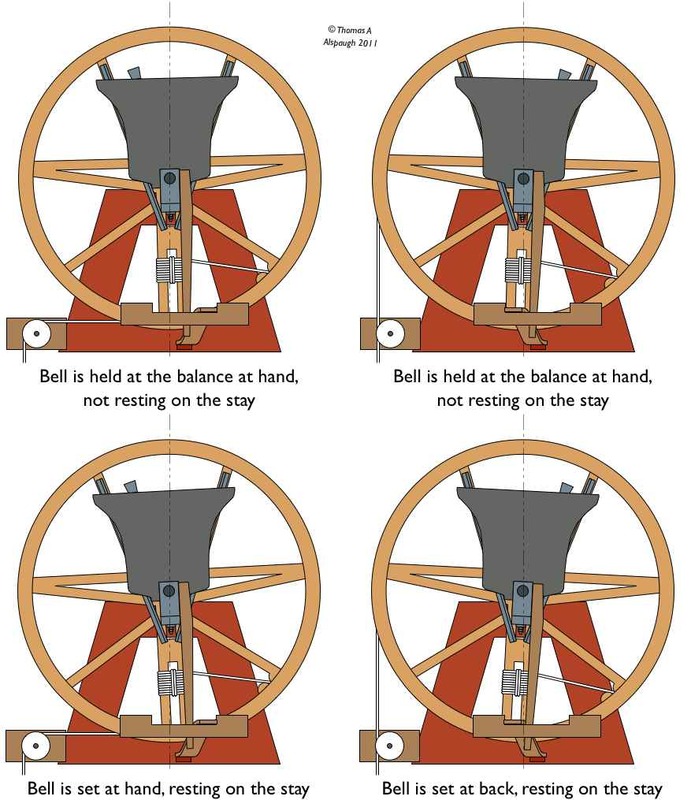 The figure below and the video A Bell’s Motion (from 1:12) contrast the position of a bell when it is set, at the balance, and over the balance. During a method, the conductor may call “Bob”, “Single”, or other things supported by that specific method. During call changes, the conductor makes many calls specific to call changes. All calls are made at the beginning of the band’s handstroke, and take effect at the next handstroke. To begin the ringing, the treble (who may or may not be the conductor) calls “Look to — treble’s going — she’s gone”, but all calls thereafter are by the conductor. Caters · Rung on nine bells (see table). From the French “quatre”, four. Check or Choke · To check a bell is to apply tension to the rope when the bell is rising, thus resisting and slowing the bell’s rise and making it ring down. The bell will then ring more quickly on the next stroke. To choke a bell is to check it vigorously. Checking a bell is quite different from testing a bell. Close · Too near the preceding bell. For example, “5, you’re too close!” is a request that the 5 ring further back from the bell in front of it. in general does everything you are going to do, immediately before you do it (except when the treble intervenes). In Plain Hunt and in most methods, it is advantageous to know which is your course bell, namely, the bell preceding you in the coursing order. Note though that you rarely follow your course bell; it (usually) isn’t the bell preceding you in the row. Instead it is the bell doing what you will be doing in a pull or two. See also after bell. You come into leads after your course bell and before your after bell. You pass the other bells in the coursing order on the way up. You arrive at the back after your course bell and before your after bell..
You pass the other bells in the coursing order on the way down. Your course bell is the bell before you in the coursing order, and your after bell is the bell after you in the coursing order. For example, in Plain Bob Doubles (5-3-2-4-6), the 2’s course bell is the 3, and its after bell is the 4 (3-2-4). Cover · To ring behind. A single bell ringing behind is said to tenor behind, while two or more bells ringing behind are said to cover. See figure at right. Dodging · Two bells dodge when they exchange places at every stroke. 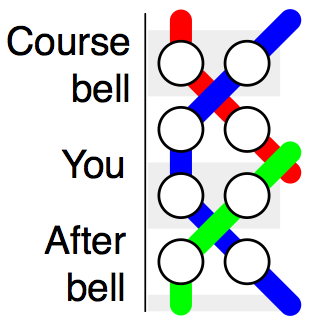 Compare placing in which two bells exchange places at every full pull (handstroke plus backstroke). See figure at left. Doubles · Rung on five bells (see table). The names singles, doubles, triples, and caters (“quatres”) all follow a 2n+1 pattern. Down · 1. 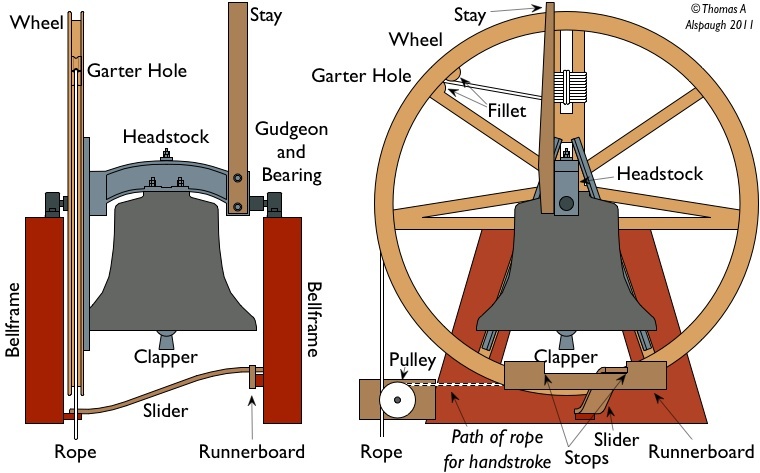 A bell is down when its mouth is facing down and the bell is not swinging (see figure). 2. Ambiguously, “down” is also used as a synonym for in, and this usage is enshrined in standard terms such as Dodge 3-4 Down. Down knot · The rope looks the same when the bell is down (thus stable and safe) and when it is up at hand (and thus unstable and unsafe). 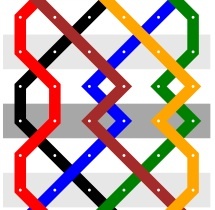 We distinguish the two by tying a different knot in each case. We teach the bowline as the down knot (see figure at right), while noting the astonishingly large variety of knots ringers tie as down knots. “Go pattern-name“ · The conductor calls “Go pattern-name” at the beginning of a handstroke, and the ringers begin that pattern at the next handstroke. For example, “Go Plain Bob Minimus” or “Go Plain Hunt on 5”. Handstroke · A ringer rings her bell using two different strokes, a handstroke and a backstroke in alternation. The handstroke occurs when the rope is wrapped around the bottom of the wheel (see figure), and both the ringer’s hands are on the rope’s sally (with the left hand still holding the tail). Handstroke lead · A handstroke in leads. Strokes in leads are of particular importance for keeping track of where one is in a method, and for helping the band stay steady. Handstroke pause · The pause traditionally left by most ringers before the first bell of a handstroke strikes. The handstroke pause is typically one bell’s worth to half a bell’s worth. There is no analogous “backstroke pause”. The first bell of a backstroke strikes one beat after the last strike of the handstroke; no pause, exactly in rhythm. The figure at right illustrates the metaphor that the first backstroke blow should “hook onto” the end of the handstroke sequence to make one continuous chain of blows. In · Towards leads, i.e. away from the back. Lead · 1. To lead is to ring in leads, that is, in firsts place. 2. A lead is a sequence of rows starting when the treble moves from leads into 2nds, and continuing through the next lead end with the treble’s two blows in leads. A lead end in Plain Bob Minor. Gray backgrounds identify backstrokes, with dark gray for the backstroke lead. both those together, marking the last full pull of the pattern. Because a ringer must select how to pull at this stroke in order to control whether they will move in or out or keep place at the next stroke, the (handstroke) lead end is the last moment at which ringers will have enough time to react to a call. Leads, Leading · A bell is in leads, or leading, when it rings before all the other bells on that stroke; the other bells follow it. Leads is the same as firsts place, only no one ever says “firsts place”, they say “leads” instead. “Look to — treble’s going — she’s gone” · The treble starts the band off by saying this. … the treble says “Treble’s going” as he/she begins to pull. The 2 brings his/her bell off the stay toward the balance in preparation. When the treble feels the bell pass the balance point, he/she says “She’s gone” and the band is off. Lower a bell, or Ring a bell down · To bring a bell from its up position to its down position. This is done by setting it swinging, checking its swing up slightly each time, and taking the rope in bit by bit as the bell swings lower and lower while keeping it under control, until the bell is down. The ringer gradually takes two to three coils in the rope as the bell comes down to keep the inactive tail of the rope under control. Lower in peal · Synonym for ring down in peal. Major · Rung on eight bells (see table). 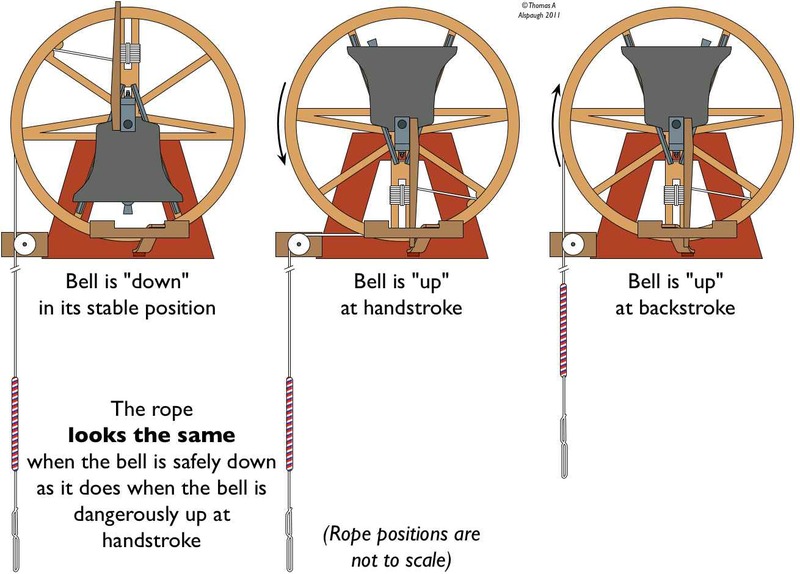 Minimus · Rung on four bells (see table). Minor · Rung on six bells (see table). n · 1. The n refers to bell #n. For example, “the 2”, “the 5”. By tradition, the 1 is usually referred to as the treble, and the largest bell of the ring (the 8 in our tower) as the tenor. 2. “n“ is also used to address the ringer of the n, in order to make any comment or request more impersonal. For example, “5, you’re too wide!” to emphasize that it criticizes the behavior, not the ringer. nths · nths refers to the nth place in a row. For example, “2nds” refers to the second place in a row, and “5ths” the fifth place. “Odds start out, evens in” · A useful mnemonic. In Plain Hunt and most methods, the odd bells begin by moving out toward the back, and the evens by moving in toward the front. Out · Toward the back, i.e. away from leads. Placing or Making places · Two bells make places when they exchange places at every full pull (i.e. every other stroke), so that each bell strikes twice in one place then trades to strike twice in the other bell’s original place. Compare with dodging, in which two bells exchange places at every stroke. Plain course · A plain course of a method is one or more consecutive leads with no calls. See for example this figure above or this figure below. Pull or for emphasis Full pull · A handstroke plus a backstroke. A pull is twice as long as a stroke. Raise a bell, or Ring a bell up · To bring a bell from its down position to its up position. This is done by pulling the rope to make the bell start swinging, then swing higher and higher, keeping it under control, until the bell is up and set. The ringer starts, after testing that the bell is down, by taking two to three coils in the rope to keep the inactive tail of the rope under control, then gradually letting rope out and releasing the tightened coils one by one. Raise in peal · Synonym for ring up in peal. Ring down · 1. To ring a bell down is a synonym for to Lower a bell. 2. A bell is said to ring down when the ringer does not keep it swinging as high as it needs to, whether by not pulling sufficiently or by preventing the bell from rising; usually ring down seems to be used when the action is not intended. Ring down in peal · To ring a group of bells down in such a way that the bells sound in rounds all the way down. Ring a bell up · synonym for Raise a bell. Ring up in peal · To ring a group of bells up in such a way that the bells sound in rounds all the way up. Rounds · Bells sounding in numerical sequence. 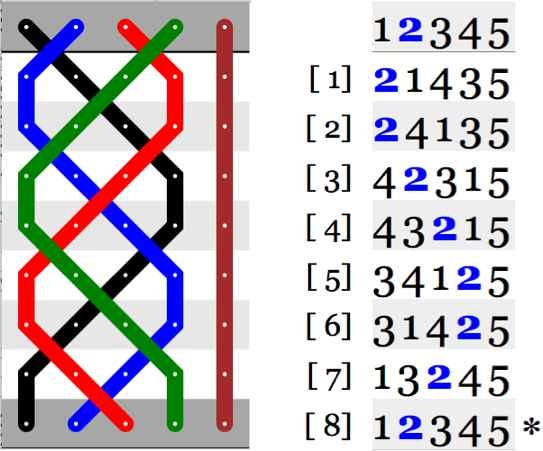 For example, the 1 through the 6 are in rounds if they are sounding in the sequence 123456. The conductor may call “Rounds, please” as a signal that the band is to start ringing rounds following the treble at the next handstroke. Row · A permutation of the bells being rung. Ringers typically start in rounds and ring a sequence of rows, with the specific sequence determined on the fly by a set of Call Changes, or by a standard pattern such as Plain Hunt or the method Plain Bob. 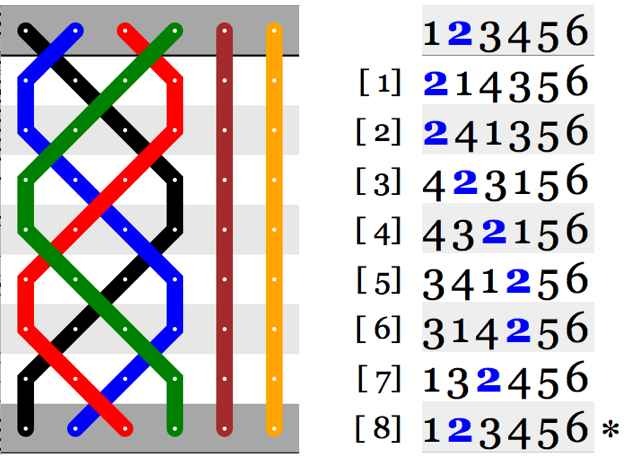 For example, if six bells are being rung, then 123456 (Rounds), 654321 (Back Rounds), 135246 (Queens), and 615234 (no name I know of but a nice-sounding row) are all rows, as well as 714 other sequences, for a total of 6!=720 rows. n bells may be rung in n! (“n factorial”) different rows (see table below). Royal · Rung on ten bells (see table). Sally · The thick wool cylinder woven into the strands of the bellrope to provide a firmer grip than the rope alone would provide, used for the handstroke. Set · 1. A bell is set when it is mouth up resting on its stay; the stay is against the slider, and the slider is against the stop on that side of the runnerboard (see figure at right). When a bell is set, its center of gravity is beyond the axis of rotation, and it is prevented from rotating down further on that side by its stay (and its slider and the stop of the runnerboard). set at back halfway through the ringer’s backstroke, with the tail at eye level, and the rope wrapping over the wheel. 2. To set a bell is to bring it gently up beyond the balance and then down so that its stay rests against the sally and the bell is set. Singles · Rung on three bells (see table). “Stand” · The conductor calls “Stand” at the beginning of a handstroke, and the ringers set their bells at the next handstroke. Stroke · Either a handstroke or a backstroke. See pull. Tail · The end of the bellrope. Tenor · The lowest bell of a ring, or when fewer than all the bells are ringing, the lowest bell of those ringing. Tenor behind · To ring behind or after all the other bells; as the other bells weave their pattern, the tenor continues to strike steadily after all the others, in other words to tenor behind. If two or more bells are ringing behind all the others, they are said to cover rather than to tenor behind. Test a bell · In the ringing chamber, the rope of a bell looks the same when the bell is down and when it is up at handstroke. A ringer tests the bell by taking the rope as if ringing (in case the bell is up and the ringer inadvertently pulls it over the balance) and giving a small, gentle tug. If the bell is down, there will be little resistance and the rope will bob as the bell swings slightly. If the bell is up, there will be a definite and increasing resistance as the bell comes off the set towards the balance; the ringer gently lets the bell back down to the set. Testing a bell is quite different from checking a bell. “That’s all” · When the band reaches the handstroke of the lead end of the method they are ringing, the conductor calls “That’s all”, and the ringers stay in rounds after the lead end. By convention, if the conductor does not call “That’s all”, the band continues with the pattern. The conductor may instead call “Keep going” as a courtesy if the band is not used to ringing several leads in a row. Touch · A touch of a method is two or more leads with at least one call of “Bob”, “Single”, or other calls supported by that method that shift the bells into a new course. Contrast with a plain course. Treble · 1. The lightest bell of a ring, or when fewer than all the bells are ringing, the lightest bell of those ringing. 2. To treble is to ring the treble. Often the treble is ringing a different pattern than the other bells, perhaps Plain Hunting or Treble Bobbing depending on the method. Triples · Rung on seven bells (see table). Turn a bell at leads/back · To turn a bell at leads is to take its place at leads. Similarly, to turn a bell at the back is to take its place at the back. See this figure in which bells successively turn others leads, and this figure in which they do so at back. Turn the bell · To turn the bell is to begin your pull just before the top of the bell’s rise, so the bell’s change of direction is under your control and the rope stays firmly on the wheel during the transition. One turns the bell on both strokes, back and hand. Up · 1. A bell is up when its mouth is facing up and the bell is not swinging. An up bell might be set, at the balance, or anywhere in between. 2. Ambiguously, “up” is also used as a synonym for out, and this usage is enshrined in standard terms such as Dodge 3-4 Up. Up knot · The rope looks the same when the bell is down (thus stable and safe) and when it is up at hand (and thus unstable and unsafe). We distinguish the two by tying a different knot in each case. 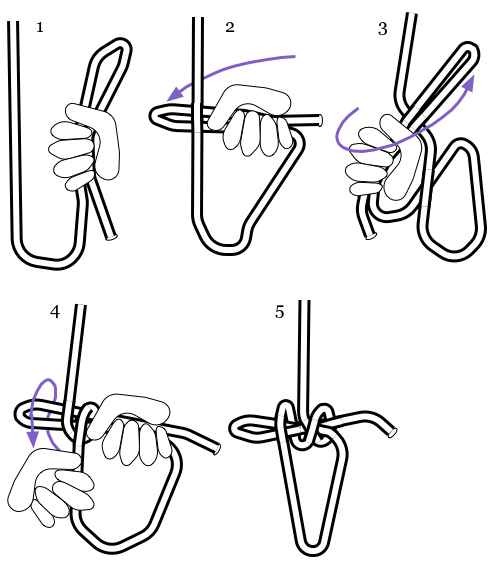 The up knot is a figure-eight knot that hasn’t been pulled tight, tied with a bight. Wide · Too far from the preceding bell. For example, “5, you’re too wide!” is a request that the 5 ring closer to the bell in front of it.